Barefoot Computing partnered with Islington Council this week to hold an event to showcase the technology achievements of primary school students since the launch of England’s computing curriculum in September 2014. 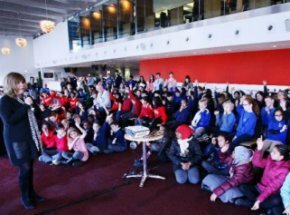 With the support of the British Computing Society (BCS), The Chartered Institute for IT, some 170 students from primary schools in Islington gathered at the Emirates Stadium for the Celebration of Computing event, which highlighted the enthusiasm of teachers and students surrounding the curriculum. Activities throughout the day included how to design an algorithm to make a rabbit, asking your friend to debug your algorithm, making music with carrots and using Scratch and Logo to draw shapes with code. Lesley Seary, chief executive of Islington Council, highlighted how the education community in Islington has embraced the computing curriculum, with 60% of schools in the area running CodeClubs. During the event Islington council announced that it aims to increase this number to 100%. Seary stressed that such events “couldn’t take place without the support of the business community such as the likes of BT and Bloomberg”. She told the students “the people who will design the next iPad, code movies and develop games – you’re the people who will do all those things”. A recent survey of 2,000 young people, conducted by Computing at School (CAS) and Microsoft, found students aged 9-16 claimed teachers need more support, with 41% claiming to regularly help teachers in using technology. Nearly half (47%) of students said teachers need more training. Asking the children in the room who felt they knew more about technology than their teachers, most students raised their hand: “That's not necessarily a bad thing. It’s the same with music teachers. Sometimes you have students who are far more gifted than us, but you can still impart some knowledge on them. Microsoft and Computing At School recently launched QuickStart Computing. With funding from Microsoft and the Department for Education and CAS, in partnership with Barefoot Computing, the training toolkit has been produced for teachers. Jack McNicholl, from Arsenal FC, was present to explain to the students how important technology is in football: “Putting technology in an Arsenal context this stadium couldn’t run – especially on match days – without an IT team. Everything from the ticketing to the turnstiles to the lights relies on technology. Our first team use technology with GPS trackers on players to measure the distance covered and that’s how players are picked for match days. And many clubs use statistics to scout for new talent around the world. She explained to the students that her daughter Rose works at a software company saying: “As a parent, I didn’t understand enough about computing to imagine that she would do that job. She makes a fortune and she enjoys doing it. All teachers should understand the value of computing. Schools also need to ensure that work experience benefits all students, regardless of gender or background. How will automation affect the IT skills gap?